Grande Villas Resort combines the best of laid back Florida luxury with the finest of fun for the family. It is close to everything in Florida you might want to see from Cape Canaveral to the wildlife refuges of the Everglades while Disney World is practically next door. For beach life you can choose between the Atlantic and the Gulf of Mexico. You will feel rather spoiled rotten and you will love it. As well as being superbly located with all of Floridas main attractions right on your doorstep Grande Villas Resort is noted for its fine facilities. You will find a large outdoor swimming pool with a central *Volcano* an outdoor spa and childrens pools as well as a basketball court shuffleboard court tennis court childrens playground exercise room and game room. The resort also has a poolside cafe and barbecue area. There are a variety of luxurious suites at Grande Villas Resort . 1 and 2 Bedroom Units have kitchens and some have Roman tubs or whirlpool baths and all have TV Telephone AC and 2 bedroom units have a washer/dryer. All the accommodations are decorated and furnished to the highest standards and the larger suites feature absolutely enormous televisions. The Grande Villas Resort is the perfect family holiday destination. After a hard day with the family at Disney World or one of the other theme parks you can come home and have a swim in the pool and then just relax in absolute first-class luxury. 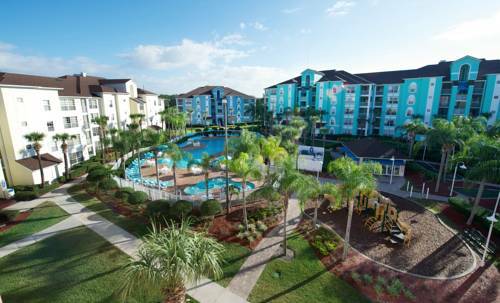 Our location puts you close to all the major Orlando attractions shopping dining and family fun. Mickey*s place Disney World is only 5 blocks from your vacation home.